This is one extended pattern to decorate your stone, make it a pendant or necklace. This kind of pattern can be make many variation when you know the structure. Some bead for decoration if you like. 2 holding cords, 30 cm. each, 1 working cords 50 cm. each. Step 2 : Making spiral part. First, prepare cords for spiral part (1 holding cords 120 cm, 10-20 working cords 40 cm. each) . Fold working cords in a half, which will be 20 cm. each side. Bring every cords to the back side of your work by treading, So every cords can work as a working cord for spiral. Then tread holding cords first to the back side of your work. Tread working cords(40 cm. cord) to the back side of your work. From my experiences, It takes around 3 cords for 1 cm. long. You will get a radial cords around your stone, the longest cord will be a holding cord in next step. Tie the double half hitch bar, holding cord to the left. Continue tying double half hitch bar around the stone. When there are spacing between holding cord and next working cords, It means you have to add more cords. Because the spiral is get bigger and the working cord is not enough to make it flat. 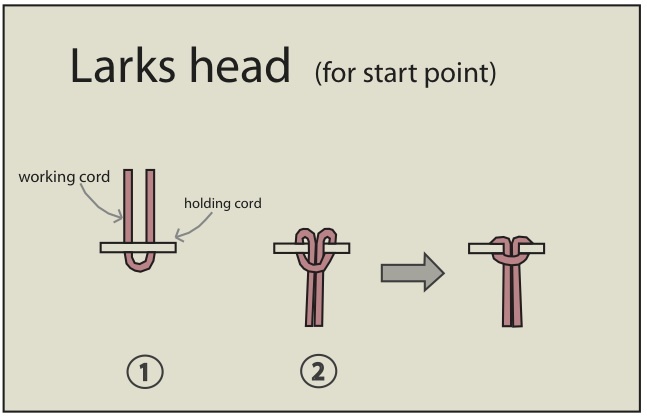 Add more cord by folding cord to a half and tie lark head knot around holding cord. 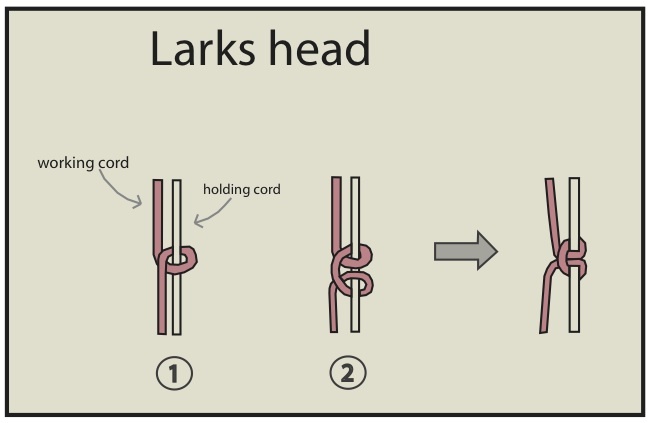 Tying Lark head by: Fold working cord and place it under the holding cords. The fold should be at the bottom and the ends at the top. Bring both ends over the holding cords, heading downward.Pass them under the folded area, pulling them firmly. This mean that you can make infinity spiral by adding working cords to your work. 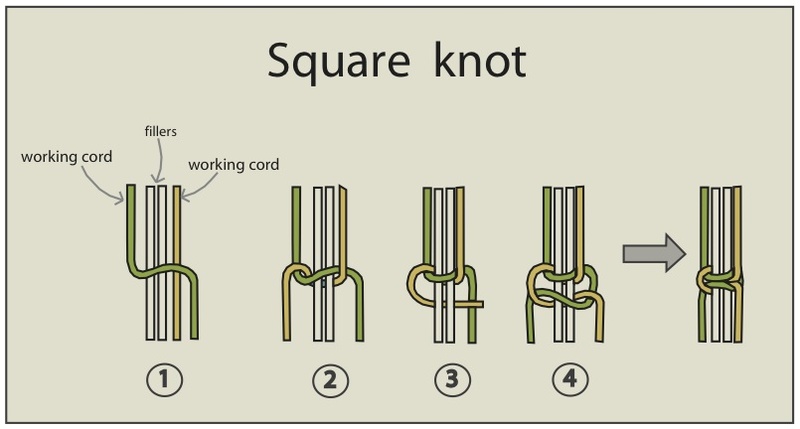 If your holding cord is nearly finish, you can add holding cord with the same method. Continuing tie double half hitch bar as your desired. You can adding some cords (I use 2 cords for each side) by tying lark head to holding cord. You can add some decoration beads by tread it into the holding cord. When finish, cut the rest of the cords except cords for necklace line and burn it. Burn every ends and keep the burning side at the back side of your work. 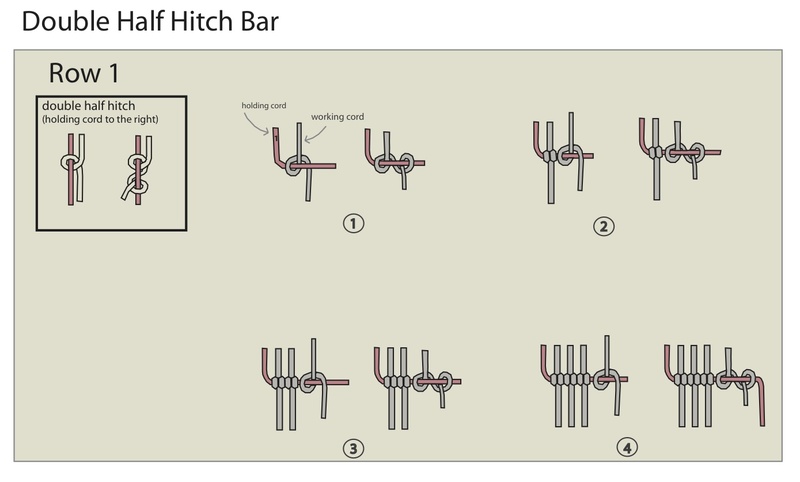 For my easy design I just tying 2 square knots follow by 1 double half hitch bar. Then braid the rest. One of my design for HonnVillage, I connect 2 spiral stone together and tread a cotton tassels at the end. This spiral extended can make a organic shape of your work easily. Hi, thanks so much for all your helpful tutorials. I was wondering if you can share how to connect the spiral stones together, is it just basically sewing them together?